North Korea on Wednesday canceled a high-level meeting with South Korea and threatened to scrap a historic summit next month between U.S. President Donald Trump and North Korean leader Kim Jong Un over military exercises between Seoul and Washington that Pyongyang has long claimed are invasion rehearsals. The North’s Korean Central News Agency called the two-week Max Thunder drills, which began Monday and reportedly include about 100 aircraft, an “intended military provocation” and an “apparent challenge” to an April summit between Kim and South Korean President Moon Jae-in, when the leaders met on their border in their countries’ third-ever summit talks since their 1948 division. Army Col. Rob Manning said this current exercise is part of the U.S. and South Korea’s “routine, annual training program to maintain a foundation of military readiness.” Manning, a Pentagon spokesman, said the purpose of Max Thunder and exercise Foal Eagle — another training event — is to enhance the two nations’ abilities to operate together to defend South Korea. The North’s statement Wednesday comes amid a slew of surprising moves from the North in recent weeks. Despite the North’s moves, some experts were skeptical about whether Kim would completely give up a nuclear program that he had pushed so hard to build. 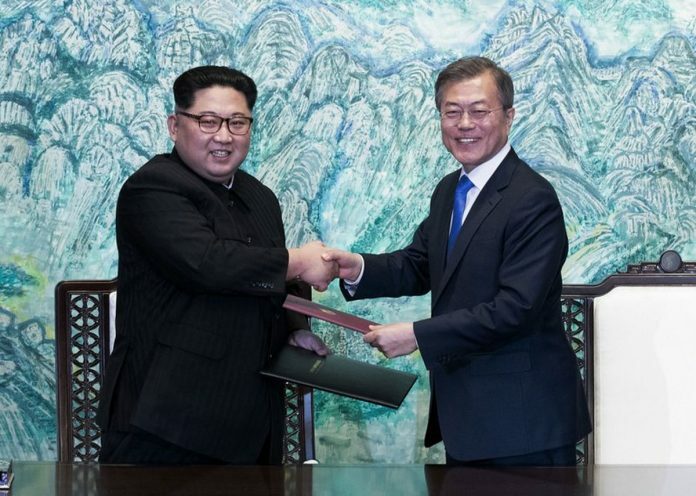 Kim has expressed his intention to negotiate over his weapons, but he still uses a long-contentious term, “the denuclearization of the Korean Peninsula.” The North previously has used this phrase when demanding that the United States pull its 28,500 troops out of South Korea and withdraw its so-called “nuclear umbrella” security guarantee to South Korea and Japan as a condition for its nuclear disarmament.